Fibrinogen consists of a six peptide molecule with two terminal D domains and a central E domain. Thrombin cleaves fibrinopeptides A and B from the E domain, producing soluble fibrin monomer. These monomers then noncovalently assemble end to end and side to side to form polymers. Factor XIIIa then covalently crosslinks these fibrin polymers to form an insoluble clot. 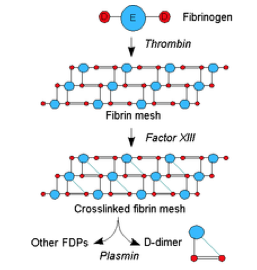 Plasmin degrades insoluble crosslinked fibrin, releasing fibrin degradation products (FDP). Among these FDPs is D-dimer, which contains a neo-epitope formed by the crosslinking of adjacent D domains by factor XIIIa. Thus, the presence of D-Dimer in blood corresponds to the in vivo formation and degradation of a fibrin clot. Since 2 to 3% of plasma fibrinogen is physiologically converted to crosslinked fibrin and then degraded, a small quantity of D-Dimer is normally present in the plasma of healthy individuals. D-Dimer has a plasma half-life of approximately 8 hours and clearance primarily occurs by the kidneys and reticuloendothelial system. Increased levels of cross-linked fibrin degradation products are found in states of coagulation activation including: DIC, deep vein thrombosis (DVT), pulmonary embolism, surgery, cancer, and cirrhosis. D-Dimer is a useful test in the work-up of a patient with suspected DIC. The International Society of Thrombosis and Hemostasis (ISTH) has proposed a scoring system for the diagnosis of disseminated intravascular coagulation (DIC) based on the presence of a predisposing clinical condition (eg sepsis, trauma), and assigning a score based on four laboratory parameters including decreased platelet count, elevated fibrin-related marker such as D-dimer, elevated protime (PT), and decreased fibrinogen. Add points to determine total score. If score is >5, results are compatible with overt DIC. A score of <5 may be compatible with non-overt (compensated) DIC. Testing should be repeated in 1 to 2 days. A recent study evaluated the analytical performance of a quantitative D-dimer assay in hospitalized patients with suspected DIC (Am J Clin Pathol 2004; 122:178-184). The majority of those with DIC had sepsis or cancer. Patients with clinical DIC had a median D-dimer value of 21.7ug/mL (reference range 0-0.5ug/mL), while the median value in those without DIC was 2.7ug/mL. Using ROC curve analysis, a D-dimer cutoff of 8.2ug/mL optimized the sensitivity and specificity of the D-dimer assay for the diagnosis of DIC (sensitivity was 98%, specificity 86%, negative predictive value 99%, and positive predictive value 66%). The high negative predictive value for D-dimer at this cutoff confirms the value of this assay in ruling out DIC. ROC curve analysis also showed that D-dimer had the best discriminatory value in the diagnosis of DIC of the four laboratory tests included in the ISTH scoring system. In the ISTH scoring system, a score of “3” (strong increase) should be assigned to a D-dimer value greater than 8.2 ug/mL. We would arbitrarily suggest that a score of 2 (moderate increase) be assigned to a D-dimer value greater than 4.0 ug/mL, but less than 8.2 ug/mL. The authors confirmed the relatively low specificity of D-dimer by demonstrating that D-dimer was elevated (>0.5 ug/dL) in 70% of 59 hospitalized patients without venous thromboembolism, cancer or DIC, and 90% of 27 patients with cancer and no evidence of venous thromboembolism or DIC. Use of the ISTH algorithm resulted in a higher specificity and positive predictive value for the diagnosis of DIC than use of the D-dimer result alone. In conclusion, a sensitive, rapid, quantitative D-dimer assay provides excellent sensitivity and negative predictive value for the diagnosis of DIC, optimized at a cutoff of 8.2ug/mL. Specificity and positive predictive value is improved by using the ISTH algorithm for DIC diagnosis. A 5mL blue-top tube is required.